Lake Oconee's destination for high quality art created by professional, area artists. Represented artists are Painters Shannon Candler, Bobby Cresswell, Diane Kendall, Sheryl Lott, Nan McGarity, Cathy McIntire, Ked Murray, Margaret Norris, David Siffert, and Gail Vail; Photographers Darren Cook and Kelly Clower; Jewelry Designers Kelly Clower and Ellen Cowne; and Potter Diane Davies. There is a juried show in Athens, held every year for 38 years. It is sponsored by the Lyndon House Arts Center. Each year an art expert (generally a museum or art college curator) is selected to judge the entries from a large selection of area artists. This show has grown in reputation over the years. Accepted work is a mark of artistic talent and expertise. We are pleased that three of our artists had work accepted into the show! 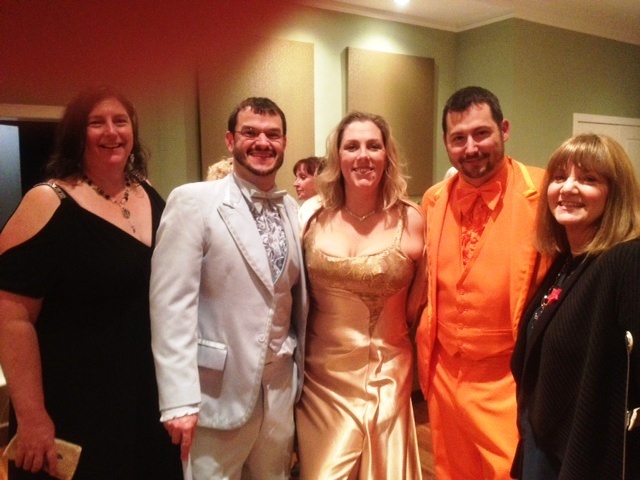 Congratulations to David Siffert, Shannon Candler, and Jean Scanlin Wright. In addition, David won the TOP AWARD!! 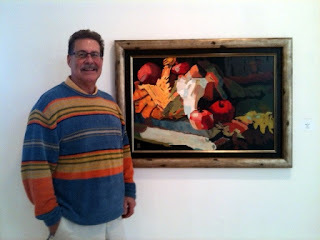 David with his winning painting, "Manger Sain"
Try to see this show. The Lyndon House Arts Center is located at 293 Hoyt St., Athens, GA and the exhibit runs from March 3 to May 4, 2013. All our artists live and work in the Lake Oconee community. Lake Oconee has been very supportive of Art of Oconee, and we love having an opportunity to give back. In the true spirit of the holiday season, we are partnering with St. Vincent dePaul to raise money to benefit area mission work. The artists of Art of Oconee are again generously donating art to the lucky winner of a raffle. Fifteen pieces of art have been earmarked with little yellow ribbons in the gallery. The selected art includes paintings, jewelry and pottery. Raffle tickets are being sold from now through Wednesday December 5 at Art of Oconee, Dress the Walls, Christ Our King and Savior Church and other locations in the area. Tickets are $5 each or 5 for $20 and all proceeds from the raffle will go directly to St. Vincent DePaul. For more information, call the gallery at 706-431-2046. On the evening of December 5, from 5 to 8 PM, Art of Oconee/Dress the Walls will host a special Holiday Open House including complimentary wine and appetizers. On that evening, the lucky raffle winner will be drawn and the winner will be able to choose the artwork of their choice from the designated pieces. Stop by the gallery to see the designated pieces and to see the exciting new art. All the art is original and created by Art of Oconee artists. St. Vincent DePaul Society was organized by Frederic Ozanam in 1833 in an effort to reach out to the needy. The local chapter is very active in the area and depends on the generosity of the community to fund their mission efforts. The fundraiser is an easy way to support their activities. We are pleased to announce the addition of two new artists at Art of Oconee. Both artists are, of course, local talent of exceptional quality. We are so happy to have them in our group and think you're going to love them, too! Sheryl Lott is a self proclaimed lover of life, and you can see that in the variety of subject matter she chooses to paint, including still life, figures that include the people she loves, beach scenes that evoke happy times for all of us, and landscapes that reflect the appreciation she has for all we have been given. Jean Scanlin Wright has made painting a particular focus in her life, after a life threatening health threat forced her to reflect on what is important to her. Painting won out and we are so glad it did! She has a particular gift with portraits, and she is available for commissions! As Jean puts it, "Painting is very personal to me. When I am commissioned to paint a portrait, I know my subject is so loved by someone that a portrait is their way of expressing that love and keeping the person close to them. It is an honor to be asked to convey that in a painting." 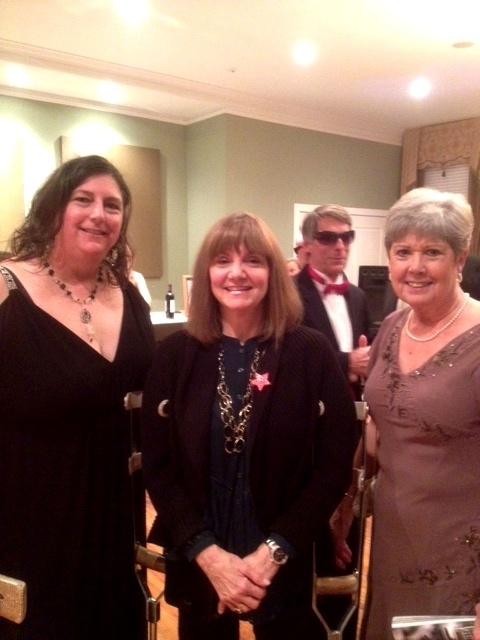 David Siffert, Nan McGarity and Gail Vail at our Spring Party!! We had our Spring Party recently. Our own Kendall took pictures. Thanks, Kendall!!! Here is a link to Kendall's blog so you can see the pictures!! Imagine dressing up in your "Academy Awards" outfit and being whisked away to the most exciting event of the season in a limo. Now picture yourself getting out of the limo to walk the Red Carpet amid the staccato flashes of cameras as paparazzi record every step. Oh, and don't forget to stop a moment so the local press can catch a few words from you on your way in to the awaiting party. 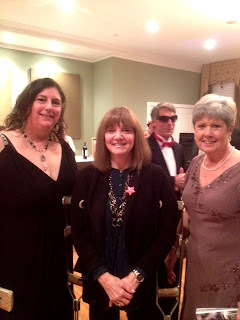 That's what it was like for all of us attending the Red Carpet Awards Ceremony hosted by Lake Oconee Living Magazine last week. There were lots of hors d'oeuvres to eat and wine to drink while we surveyed and made bids on silent auction pieces, and visited with so many of the other guests attending that evening. As winners of the Best Art Gallery category, we were honored with reserved seating during the awards presentation. It was a fabulous event and it made us appreciate all the more our gift of being voted number one. ...you like us, you really like us!!! 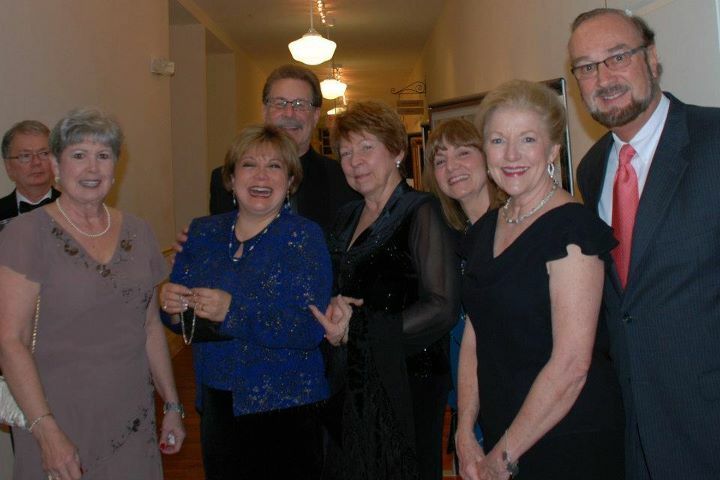 All photos were taken by our own Maria Siffert, unless otherwise noted! Barry Clower, Kelly Clower, and David Siffert with our AWARD!! Lake Oconee Living Magazine conducts a survey each year of the Best in local "everything" and the voting determined that Art of Oconee is the BEST ART GALLERY! Needless to say, we are thrilled and honored to receive this award. We want to thank all of our supporters who voted for us and made this happen. We are a group of local artists who feel passionately about what we do. We have worked hard to provide the Lake Oconee area with local art that speaks to the artist in all of us! From all of us at Art of Oconee. Why do people like the idea of giving during the holidays? Just think what it would be like if nobody gave, or got, during this particular season. When you give, you also get, because it makes you feel good to know someone else is the recipient of your gift. 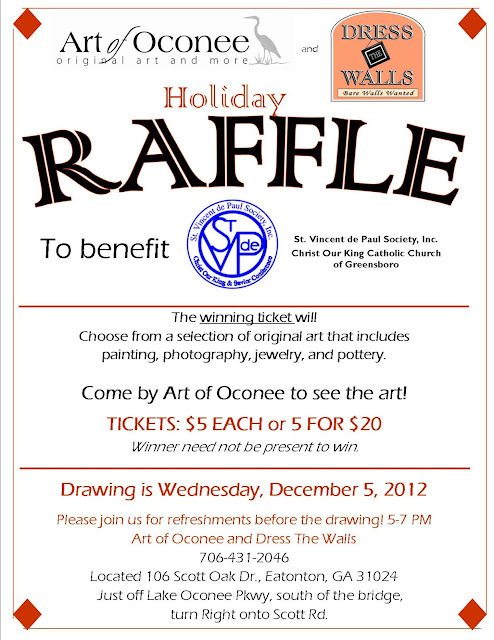 That sentiment is the primary reason for Art of Oconee's Raffle this holiday season. What did we give? Each artist designated one piece of art (and that art was worth up to $700) to be included as part of the selection, by the winner, for their prize. What did we get? As a gallery, we know the money we raised for the St. Vincent de Paul Society is going to go to lots of recipients. As for the artists whose work was chosen, they get to feel good knowing the winners chose their work over all the rest, and that they helped to make our event a true success. There is one thing we need to clarify. The parishioners of Christ Our King and Savior Catholic Church participated by buying many of the tickets in an effort to support the efforts of all involved. When you think of it, the real winner is the community of Lake Oconee. It takes a lot of people to make this work, and our community stepped up to make it happen. Thanks to the 14 artists, event volunteers, Maria and Dave Siffert, owners’ of Dress the Walls & Art of Oconee Galleries, and all the parishioners and friends for purchasing raffle tickets. The Christmas Art Event raised over $1600, which will benefit the St. Vincent de Paul Society’s programs for Greene, Putnam, and Hancock Counties. The second raffle winner of the Christmas Art Event drawn on December 21st was Rita Nelson. 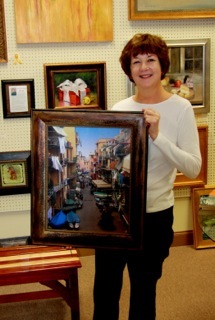 Rita selected a framed photograph of an Italian village as her prize as shown to the right. The third raffle winner was Pat Frain. Pat received a painting from David Siffert. The first raffle winner of the Christmas Art Event drawn on November 29th was Ellie Davis. Ellie selected Diane Davis' Black River Jug and Multi-Color Baker as her prize. Happy New Year to all of us!! We Can Send Our Blog to Your Email. Just Sign Up! Art of Oconee, 106 Scott Oak Drive, Suite A, 706-431-2046, is Lake Oconee's gallery for quality original art created by 14 local area artists. We have on display a variety of mediums and styles from our painters Shannon Candler, Bobby Cresswell, Diane Kendall, Sheryl Lott, Nan McGarity, Cathy McIntire, Ked Murray, Margaret Norris, David Siffert, and Gail Vail, our photographers Darren Cook and Kelly Clower, our jewelry designers Kelly Clower and Ellen Cowne, and our potter Diane Davies. The artists all share in the responsibilities of the gallery. Our partnership with Dress The Walls means there is someone in the gallery to assist you and answer questions six days a week! This blog was created by Cathy McIntire, who is responsible for most of the content. Said content may or may not reflect the ideas and philosophies of the artist members of Art of Oconee, but nobody has said anything yet, so I guess it's cool. To see more of what Cathy has to say, click here to visit her blog. Oh, and don't forget, this stuff is copyrighted, so contact us if you want to use or share. Simple theme. Theme images by lobaaaato. Powered by Blogger.